Almost four months back, Netscape developer, Marc Andreesen, unveiled the web’s very first social web browser tagged as “RockMelt“. The browser developed, with a trend on introducing a better and more intelligent way on interacting with the social world on the web. Almost two years of research and design made it possible to reveal the beta version of the browser available for a limited number of users, marked as invitation only. RockMelt proudly announced today the next step by rolling the browser into a public beta. As earlier, the Chromium based social browser, RockMelt, was invitation only this entire time, the Marc Andreesen backed project is now available for download. The company has reported on flocking in hundreds of thousands of active user. 20 to 30 percent of users who downloaded RockMelt have used it at least once every seven days, which sounds pretty reasonable, compared to other browsers. RockMelt regularly administers updates with 15 updates recently made, including the YouTube app, Chromium 9, support for secure RSS feeds, and tweaking the log-in process. RockMelt requires Facebook log-in details in order to access RockMelt’s social networking features. 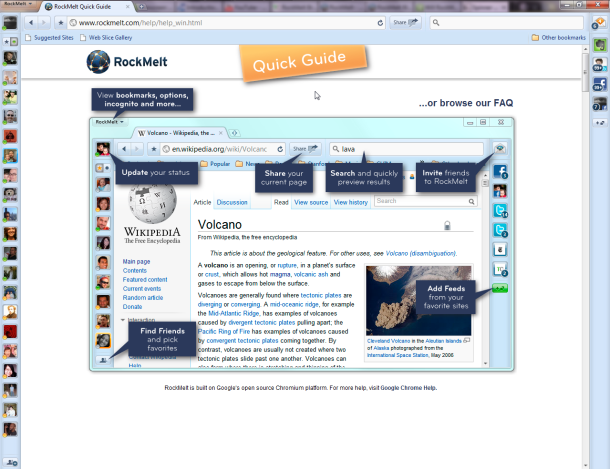 Actually Flock was the first social browser; but RockMelt is the better social browser.